While fighting against superstitions prevailing in the society, our activists come across and confront gurus of mystical cults, shamans, practitioners of ancient systems of medicine and faith healers. All of them claim that they possess some special power through which they can prescribe miraculous cure for the physical or mental pains. To convince about their superiority and miraculous power various types of unscrupulous methods are used to mystify the illiterates. Particularly the communities who stay in remotest village sans basic amenities are pray to these Babas who exploit them unashamedly. The people who have to do hard labour are in a closed shell who neither can think of cause and effect relations nor reason and fight against high handedness of self proclaimed Babas. Gomashababa (Gomasha means cattle fly) is a self announced Baba well known in Hatakanangale Taluka of Kolhapur district. Baba hails from Karochi village. 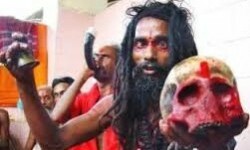 He and his paid cronies managed to convince that he possesses mystical power through which he takes out dirt and dead cattle flies from the ears of the visitors so as to give satisfaction and comfort . Hordes of visitors stood in a queue to get the ‘treatment’. This was going on for years until one of our activists come to know this strange treatment by accident. After detailed investigation our activists convinced of his malpractice. Baba used to pour some liquid mixed with chemicals and made patients to lie down. He will take coloured thin glass tube already filled with dead insects and dirt, and place inside the ear. After sucking he will hand over dead insects and place the dirt and dead insects on the palm of the visitor convincing that all the muck was inside your brain and Baba has managed to get rid of the same. He used to charge Rs. 10 per insect. Thus patients were paying at least Rs. 100 during their treatment period. Our activists found that Baba is addict of opium and alcohol. He and his cronies exploited the illiterates since they needed hard cash for their extravagant lifestyle. The unit members told him to stop this nonsense at once or otherwise face the consequence. Activists threatened him that he will be handed over to police if he continue with such heinous act on gullible visitors. Baba realising his helpless condition agreed to our activist’s suggestion and promised to lead a normal life. Considering the various ways and means deployed by these so called Gurus and Babas staying in remote villages our activists have to be very alert and should develop communication network so that such activities can be nipped in the bud itself.